A club-and-machete wielding mob in Indonesia butchered nearly 300 crocodiles in an act of revenge after a local man was killed by one of the reptiles, authorities said Monday. Images from the scene showed dozens of dead crocodiles lying on top of each other and covered in blood after the attack at a breeding farm in Papua province. The incident happened Saturday following the funeral of the 48-year-old man who was killed after he entered an enclosure while looking for grass to feed his livestock, police and conservation officials said. "One of the crocodile farm employees... heard someone screaming for help and ran to the scene where they saw a person being mauled by a crocodile," said Basar Manullang, head of Indonesia's Natural Resources Conservation Agency in West Papua. The man's family and "hundreds" of other locals, angry over the farm's location near a residential area, marched to the police station where they were told the breeder would pay compensation, he added. 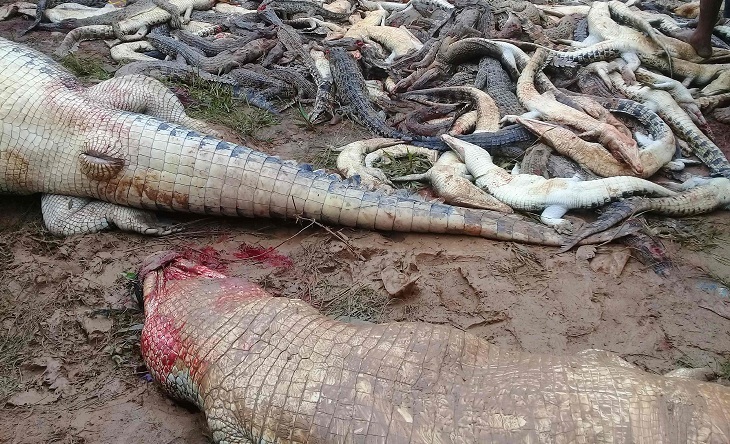 But the mob was not satisfied and headed to the crocodile farm armed with clubs, knives, machetes and shovels which they used to slaughter some 292 crocs, ranging from palm-sized babies to two-metre adults, authorities said. Outnumbered police and conservation officials said they were unable to stop the grisly attack. Criminal charges may be laid, they said. "For now we are still questioning the witnesses," said district police chief Dewa Made Sidan Sutrahna. The bloody incident highlighted the dangers of trespassing into a breeding farm and also raised concerns about its safety. "They have to make sure that the farm has good barriers and they need to step up security with CCTV and security signs to warn people" of the dangers, said Dwi Nugroho Adhiasto, programme manager at the World Conservation Society's Indonesia office. In March authorities in Borneo shot and killed a six-metre long crocodile after it ate a local palm plantation worker. Two years ago, a Russian tourist was killed by a crocodile in the Raja Ampat islands, a popular diving site in Indonesia's east.